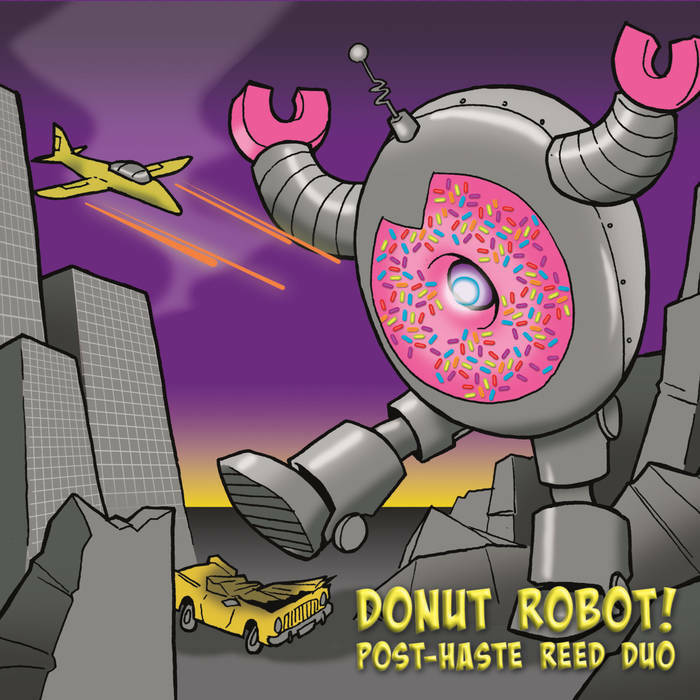 Gapplegate Classical-Modern Music Review: Post-Haste Reed Duo, Donut Robot! 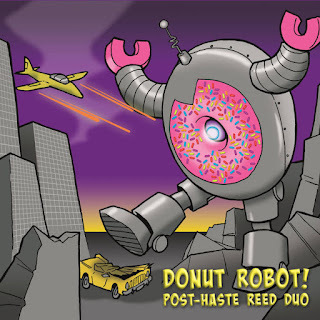 There are album concepts and cover illustrations that grab my attention and I will admit that the art on Donut Robot! (Aerocade Music 010) by the Post-Haste Reed Duo is a favorite.What's wrong with a bit of outlandish humor? Nothing at all as far as I am concerned. All the better of course if the music turns out to be very much worth our ear-time. That is the case here as limber-timbred saxophonist Sean Fredenburg and bassoon stalwart Javier Rodriguez take us on an imaginative journey through six compositions and compositional suites. The music if we must label it might be Post-Modern Modern Neo-Classical? It has form and force, from the beautifully apt opening title work by Ruby Fulton to the closing four-episode adventure-sequence "Snapshots" by Takuma Itoh. One should not be blase about it all without paying close attention, for a saxophone-bassoon duo can be as full and lively as anything you can imagine, provided the works are as interesting as they are here and the execution is natural and artful, as the Post-Haste Duo show us consistently and happily. If the composers are not so well-known, the works show us we have missed them at our own, well not "peril" so much as lack. So we are invited to sit and hear the nicely turned gems from Ruby Fulton and on to miniatures by Drew Baker, Michael Johanson, Edward J. Hines, Andrea Reinkemeyer and Takuma Itoh. No notes are wasted and the base-grounding of the two reeds never seems lacking in fullness of content. The robot looms yet we the listeners triumph in the hearing. Post-Haste Reed Duo emerges from the underbrush to conquer the sweet would-be treat and its relentless advance! Go on Duo, keep going and we cheer you forward!